What's this? Isn't it a day early for our look back at the ARIA singles chart from this week in 1988? That's right, but because 1988 was a leap year and we're in a non-leap year, our weekly recap moves forward a day. Otherwise, it's business as usual. As I previewed last time, two artists who'd started out singing in well-known American bands of the '80s scored solo hits this week in 1988. 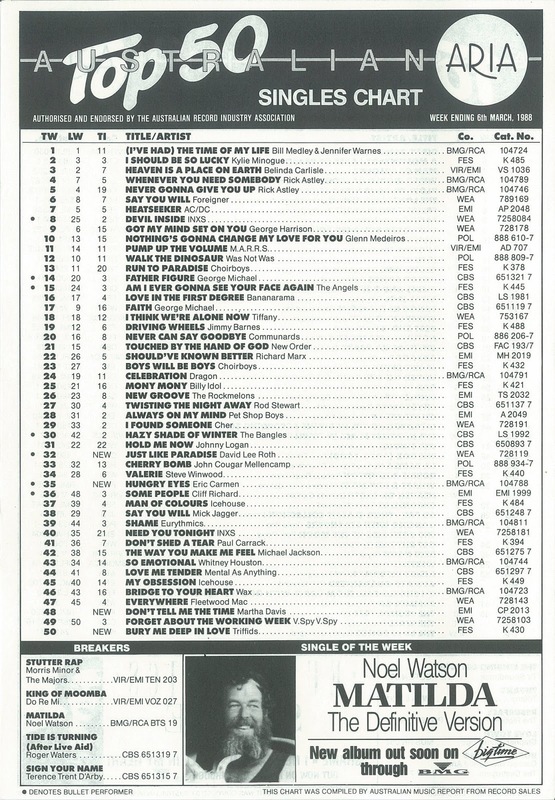 What I didn't mention last time is that a third act to join the top 50 this week was originally lead singer for an Amercian band in the early '70s - and his new solo hit was taken from the week's number 1 album. Another song from the number 1 album, the Dirty Dancing soundtrack, was on top of the singles chart this week in 1988. Bill Medley and Jennifer Warnes stayed put for a fifth week with "(I've Had) The Time Of My Life". "To Her Door" had given Paul his highest-charting song, but this cheery next release from Under The Sun became his least successful top 100 single to date. 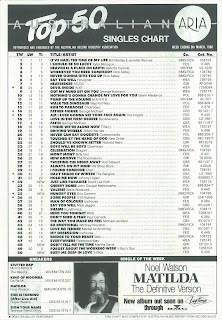 Of course, plenty of his other singles hadn't even made the top 100 so it wasn't all bad. 1988 was the year of Australia's bicentenary, celebrated on Australia Day (January 26) to mark 200 years since the arrival of the First Fleet. A massive live TV special, Australia Live: The Celebration Of A Nation, aired on three networks and made use of our very first satellite (which even had its own nifty name: Aussat) to whiz around the country. One of the musical acts featured was this guy, who performed his take on "Waltzing Matilda" in a John Williamson kind of style. Seems like patriotic spirit only goes so far on the ARIA chart. Nevertheless, Noel would be wheeled out to sing the song again at that year's AFL grand final (and it's that performance which is below). From one celebration to another - this time, Melbourne's annual Moomba festival which, in an amazing bit of synchronicity, takes place at the start of March (2013's event starts this Friday). Traditionally, a king and queen of Moomba had been crowned each year - although in 1988, in a not so great bit of synchronicity, that title was changed to the Moomba Monarch. Unfortunately for Do-Re-Mi, their enthusiasm about the event wasn't shared by the rest of the country, with a national chart peak just outside the top 50. I've mentioned in the past that many Aussie classics (like "Throw Your Arms Around Me" and "Sounds Of Then (This Is Australia)") weren't actually very big hits - and here's another acclaimed song that failed to make a commercial impact. The Triffids had been around since the late '70s but this was their first top 50 appearance after reaching number 64 with 1986's "Wide Open Road". "Bury Me Deep In Love" would be used later in 1988 as the theme to Harold and Madge's wedding in Neighbours, and even received a re-release in 1989 in the UK when the episode finally aired there - but it would be no "Suddenly". The Triffids managed one more album in 1989 before calling it a day. Here's our first solo single from a former lead singer. Martha had been frontwoman for The Motels until their split in 1987 and wasted no time releasing her solo album, Policy. This first single was a big hit in Australia, but it didn't fare anywhere near as well back home in the US. As a result, Martha wriggled out of her record deal and didn't release a follow-up album until 2004. Rounding out our former lead singer triple play is this rock classic from the sometimes Van Halen frontman (he'd split from the band a couple of years earlier and wouldn't formally reunite with them for two decades). "Just Like Paradise" was from DLR's second full-length solo album, Skyscraper, and saw him return to the Australian top 20. 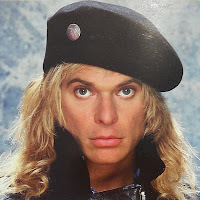 He'd previously scored hits with his 1985 cover versions, "California Girls" and "Just A Gigolo/I Ain't Got Nobody", but Australia had largely been indifferent to his 1986 LP, Eat 'Em And Smile. Most recently, "Just Like Paradise" was heard kicking off the first act of stage show (and film adaptation) Rock Of Ages in a mash-up with Poison's "Nothin' But A Good Time". Next week: we'll remember six new entries, including a big novelty rap hit and a couple of often overlooked tracks by two great Aussie bands. Meanwhile, I'm aiming to start my countdown of my favourite songs from 1992 in the next couple of weeks - if I get organised in time, I'll kick things off this weekend. I hated the Martha Davis song at the time, but have since grown to like it. When I first saw the video, I remember thinking she looked how I imagine a lesbian would look, as a 9 year-old, with that suit, tie and short hair. For some reason I mentally associate Eric Carmen with my (now-retired) GP; there is a (sort of) similarity in appearance between them in this video (or was, at one point).